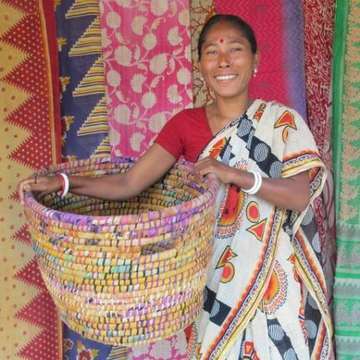 Basket maker Judy Hart and Ten Thousand Villages Lincoln are collaborating to create a hands-on experience, investigating the coiled baskets made by the women artisans of Hajigani and Dhaka Handicrafts in Bangladesh. This workshop includes two components: 1 - learning about these skilled basket weavers and how their organization is fighting poverty in Bangladesh and 2 - basket making using the same techniques as these talented Bangladeshi weavers. More details to come! Don’t miss this unique opportunity to learn more about empowering women through fair trade and learning a centuries’ old art in the process. More about Judy Hart: Judy is a theatre professional and basket weaver. She is the Director of Angels Theatre Company Lincoln and co-director of Camp Summergold. Judy learned to weave baskets in the 1970’s in New Jersey, when she bartered weaving lessons for sewing alterations. Judy was a 2013 CSA artist with the Lincoln Arts Council and continues to teach basketmaking locally, whenever anyone shows interest. More about Ten Thousand Villages Lincoln: Ten Thousand Villages Lincoln was started by a small group of people right here in Lincoln 35 years ago. These community members saw a unique opportunity to connect people here in Lincoln with people all over the world by selling their handmade products and ensuring they are paid fairly for their work. Their vision was to eradicate poverty right at its source and to empower artisans all over the world. We are a 501c3 non-profit organization whose mission is to create opportunities for artisans in developing countries to earn income by bringing their products and stories to our markets through long term, fair trading relationships.